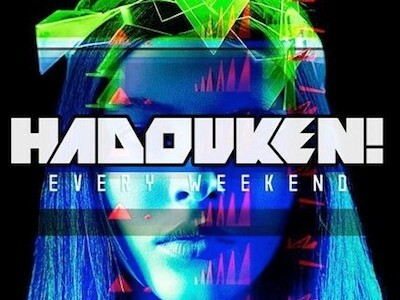 For the last few years Hertfordshire based band Hadouken! have been largely notarized for their spectacular 90s referenced gaming band name rather than their efforts in the musical realm. That said, they have built up a small, loyal and cultish following by capturing the British youth with their eclectic blend of music which spans the genres. Grime, indie, electronica, drum and bass, dubstep, rap are all lines which are crossed in their experimentations. ‘Music For An Accelerated Culture’ (2008) hit number 12 in the charts and sold over 100,000 copies worldwide. On the other hand, their 2011 release ‘For The Masses’ received a host of negative reviews from both the rock and dance community acquiring the moniker of “being the Prodigy and Pendulum successors but without the musical talent.” Ouch! So is the latest 2013 release set to challenge these (mis?)conceptions? We at Soundsphere would like to think it’s a step in the right direction. The cutting it short, ten-track offering from Hadouken! gets off to a powerful start with the apocalyptic sounding ‘The Vortex’ which holds those Prodigy-esque dance floor beats, and erratic dub sounds that’ll capture the nights of summer. The lyrics are somewhat lacking in substance (“Each and every weekend / We spend it like the whole world’s ending.”) but when were lyrics ever important in dance music? This is a band where interaction with the fans is at the top of their agenda and as a result their business initiative, spunky and intuitive internet attacks are all things that have worked in their favour. The viral marketing campaign for the ‘People Are Awesome’ video featuring ‘Levitate’ has thoroughly overachieved for this band projecting them to the pseudo-stardom that they could only have hoped for to launch their third album from. The first official single release is an ear-catcher of a song with dreamscape beginnings merging with trance-like beats. These build to emotional crescendo before erupting into the heavy bass sound you know will be pummeling the airwaves over the coming months. Where ‘Levitate’ is catchy and hook-ridden, ‘Bliss Out’ and ‘As One’ seem to be white noise with nothing to really distinguish them from the crowd. Slightly mellower, hauntingly industrial in style with melodic overlays and poppy chorus. The most powerful track on the album is ‘Parasite’, its exploratory nature creates a dark, grimy atmosphere to complement the messed up dub sections. “Bad Signal” helps add an element of contrast with the humourous Supremes/Kim Wilde samples. Bonus track “Daylight” is predominantly production duo Drumsound and Bassline Smith but features Hadouken! It is an album highlight by far but perhaps this is to be attributed to the duo rather than the band themselves. It is certainly bass-driven but perhaps cruise-control isn’t quite what they had in mind? This isn’t groundbreaking work, but it succeeds the back-catalogue. 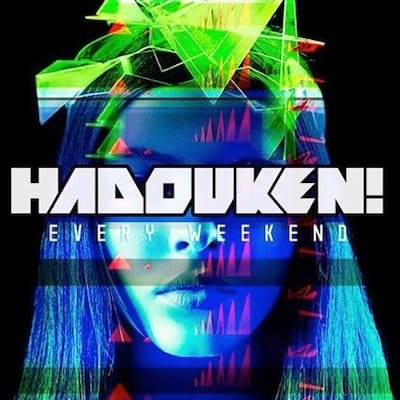 Tags: every weekend, hadouken interview 2013, Hadouken!